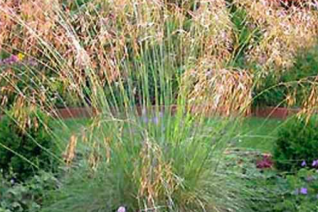 This is the giant straight species that is so popular for its soaring silver stems and golden drooping awns. To 6′ tall in bloom from a tight but large basal clump of fine deep green leaves. Perfectly evergreen with a great winter appearance. 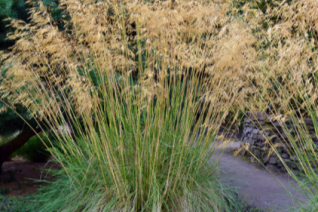 Very easy to grow grass that provides spectacular garden effects. 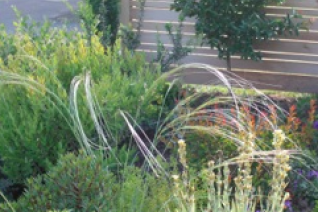 Incredibly drought tolerant in any well drained soil- including clay if it is not allowed to become bone dry concrete. Flowers make a great see through “scrim” in gardens. Fun to grow. Moderate deer resistance.